Town Cafe, 2352 Grand Island Blvd. is having a New Year's Eve dinner special of surf & turf. A delicious 8 oz. filet and 8 oz. lobster tail with choice of potato and soup and salad bar is available for $45 per person. The special will start at 5:00 p.m. Reservations only, call Lynn at 773-7373. UPDATE: Fully booked, need to pay asap! Mallwitz's Island Lanes, 1887 Whitehaven Rd. is hosting Family New Year's Eve Bowling party on Sunday, December 31st. Four fun parties to choose from! 1pm - 3pm, 4pm - 6pm, 7pm - 9pm, or 10pm - Midnight. Party includes: Cosmic Bowling for two hours (shoe rental included), Unlimited pizza and pop, hats and noisemakers, simulated countdown with sparkling juice "champagne" toast (Actual countdown at Midnight!) , and a free game of bowling coupon! All for only $13 per person. Must be FULLY PAID by December 29th. We're doing full prepaid this year just to expedite the check in process to get you on the lanes faster and have more fun! Reservations are required and spots fill up FAST, so call today to reserve your spot! Island Ship Center recently rebranded the retail section of the store located at 1879 Whitehaven Road. It is called Seema Boutique, in honor of Fahim's "better half", who has been sourcing and making gifts for the boutique for the last three years. On Small Business Saturday, November 25th, Seema will be having a purse party from 9:00 a.m. - 5:00 p.m., in the business center, and will have a wide variety of "savvy handbags, attractive purses and chic clutches" available for sale. You will also be able to shop her unique selection of gifts. A 20% of coupon for any one item is available here. You don't have to print it out, just take a picture on your phone to enjoy big savings! From left: Ray Braselton with student. Ray Braselton is a musician dividing his time between his longtime home and business in Marion, NY and now West River Road on Grand Island. 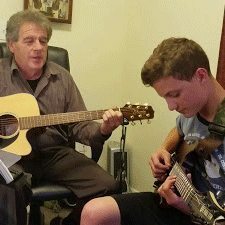 He teaches guitar, piano, band instruments, drums, uke and vocal lessons, and provides music entertainment for private parties, corporate business functions, senior centers, nursing homes, and town festivals. Ray grew up in California and moved to New York in 1968 to study music and teaching. He opened a studio in Walworth, NY in 1973. 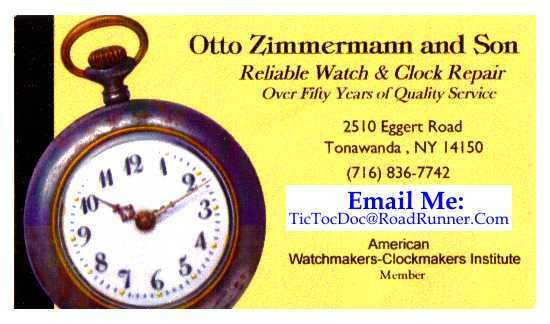 In 1975 he moved the business to Marion, NY, which he ran until 1990. After 10 years teaching music lessons at his home, he again opened a new studio which is now located on S. Main Street in Marion. Ray started teaching music, Friday and Saturdays on Grand Island in February 2017. You can read a more in-depth biography at his website, www.braseltonsmusic.com and see a list of the lessons offered and entertainment available. He can do it all! Music of the 1920's-30's, 1940-50s crooner songs, 1960s-90s rock & love songs, to a few of the current hits. In addition Ray does folk music, Beatles, Christian music, Country, Celtic and much more. Thanks for becoming an Isledegrande advertiser. From left: Eric Fiebelkorn, Kalie Palumbo, Jodi Notaro, Dr. Thomas Notaro, Jen Paonessa, Dr. Andrew Green, Kathy Good, Dr. Michael Baase and Lisa Dilliot. 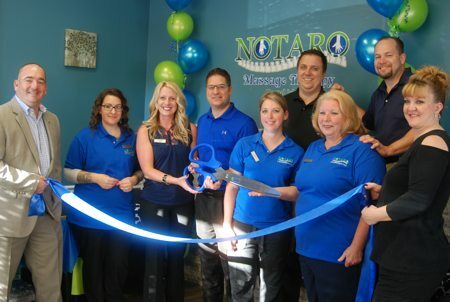 Notaro Chiropractic celebrated their beautiful, newly expanded office on Tuesday, September 26th, with a Chamber of Commerce ribbon cutting and open house. Dr. Thomas Notaro and wife Jodi have made the space, located at 2283 Grand Island Blvd., inviting and homey. They offer chiropractic, massage therapy and acupuncture services in three locations; Grand Island, Niagara Falls/Wheatfiekd and East Amherst. You can make appointments and ask any questions you may have online at their website, grandislandchiropractic.com, or by calling 773-2222. They also have massage specials and a $5 off coupon for massage and acupuncture services. Left Diane Garey, right: living room make-over. Welcome Diane Garey Interiors as a new Isledegrande advertiser. 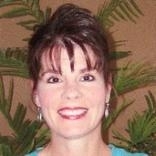 Diane is an Island resident with 25 years of experience in the design field. She has worked as Regional Supervisor for Perry Ellis in New York City, as well as store designer and manager for fine retail furniture and design companies in Western New York. 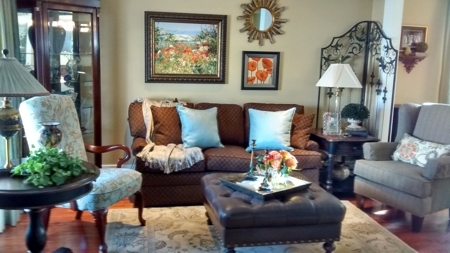 Choosing an interior designer/decorator can be scary, but Diane's experience, connections and style can bring your vision to life - on schedule and on budget. Diane will work her magic on new builds, projects in your home, big and small, and has a special affinity for staging homes to sell fast! She gets to know her clients likes, dislikes, and family lifestyle, then presents all possible design solutions, usually saving them considerable money. Check out her website for a more in-depth look at her design philosophy, services and photos of just some of her projects. See website. Diane and her husband are parents of two boys and are involved in Grand Island Cub Scouts, St. Stephen RC Religious Ed & American Cancer Society Relay for Life. Grand Island Business to Host National Workshop Training for Independent Retail Shippers from Across the US. Grand Island, NY... September 14th, 2017 - Over 40 independent retail shipping store owners are scheduled to arrive in Grand Island for the weekend of October 27-29th to take part in a training workshop -- to learn, network and grow their businesses. The site of this training will be Island Ship Center, a small family business that has been operating on Grand Island for over 11 years and is now dubbed the "Spa Of Shipping." Over the past three years, Island Ship Center has grown from an 850 square foot building to a 3000 square foot mail and business center, complete with a 24 hour access mailbox area and a warehouse space that includes a furniture shipping facility, secure storage room and a packing station. The event, called the Niagara Falls Regional Workshop, is run by an organization called the Association of Mail and Business Centers, or AMBC for short, headquartered in Claremont, California. The full two and half day event will be jam packed with valuable hands-on training for fellow shipping and business center store owners, looking to add more relevant services to their stores and, as a result, stay competitive in the digital economy. Classes on the schedule include hiring and training millennials, social media strategies (beginning and advanced levels), print for pay solutions for stores, graphic design made easy, taking the mystery out of freight shipping, making your business part of the community by keeping it social and experience-based, and many more. What began as a regional training event has now turned into a national workshop, with store owners attending from over 15 states across the country, including Oregon, California, Arizona, Minnesota and Texas. Since 2006, Island Ship Center has been a favorite of the Grand Island community - a place where you are guaranteed to find a big smile and a solution to any shipping conundrum. Owners Seema and Fahim Mojawalla are passionate about the Grand Island community. Fahim is active in the Grand Island Chamber of Commerce and sits on its board of directors; Seema operates Seema Boutique, selling unique, quality gifts, as well as her own line of soaps and lotions out of a showroom at Island Ship Center. Together, they are raising five children, all of whom are active in their Grand Island neighborhood. Seema and Fahim are also passionate about the mail and business center industry, both serving on the AMBC board of directors: Seema as Director of Innovation and Fahim as Director of Social Media. Together, they coach other businesses on design and social media strategies to help each grow into their full potential and discover their best selves. To find out more information, please visit www.IslandShipCenter.com, call Seema or Fahim at 716-773-6300, or stop in! For information about AMBC or the event, please visit www.AMBC.org. Resident & Community Council President Judy Gersitz, center, cuts the ribbon. 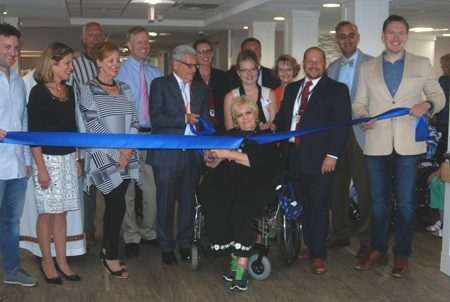 Elderwood Grand Island celebrated the opening of their Seasons Memory Care Program with a Ribbon Cutting and reception on Wednesday, August 23rd at their Grand Island Blvd. location. Many company representatives, local officials, Chamber of Commerce members and patients and families were on hand to enjoy the presentation, string quartet and delicious buffet made by the Elderwood kitchen staff. The Seasons program is located on the 2nd floor of the facility and provides a secure unit with a "friendly, home-like atmosphere." The program enhances the quality of life for individuals with forms of dementia, by focusing on their current abilities. 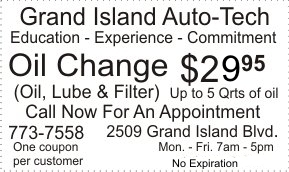 Check out the Grand Island website to view all the services Elderwood offers. Congratulations to Islanders Tina and Michael Kibler. 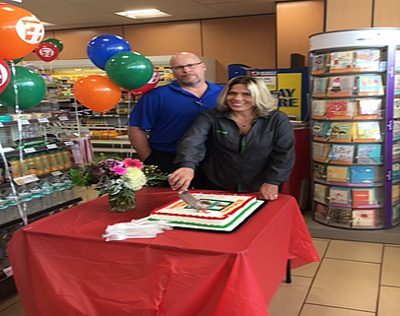 They are the new franchisees of the 7-11 convenient store located at 1787 Love Road. They had their Grand Opening on Wednesday, August 23rd. Tina and Mike are all about being a great neighbor and getting involved. They are committed to serving their customers, and offering innovative convenient products and services. It's all about making customers' lives easier. MHA is now largest primary care physician group in region comprised of 50 providers and 200 support staff in seven offices. GRAND ISLAND, NY - After more than two years of discussion and planning, the physician partners of four independent and premier pediatric practices have come together to form the Medical Health Associates of Western New York, PLLC (MHA). The practices now comprise the largest primary care physician group in western New York. Island Pediatrics (Grand Island, NY). The physician partners developed a strong mission to be the practice of choice for families of Western New York and the employer of choice for professional, clinical and support staff. "By combining the resources of these successful practices and likeminded pediatricians, we will strive to expand our clinical service and patient access as well as participate in research and education initiatives," said Michael Heimerl, MD, Vice-President of MHA. "At the same time, it is business as usual in that our patients and the families we serve will not see any disruption whatsoever in the care our physicians and staff provide." An announcement on Facebook recently confirmed the long awaited news that the Pepper Mill restaurant on Grand Island Blvd. near Bedell Road is opening. It will be called 773 North and owners are Executive Chef Christy Zippier & her husband Jason Zippier. The projected opening is in November as they are gutting the building and starting fresh. From Facebook: "Their mission is to bring a new dining experience to Grand Island combining a great atmosphere with a trendy but humble menu. From homemade soups and fresh salads to gourmet sandwiches and updated classic comfort foods there will be something for everyone; all made with real, simple ingredients. Stay tuned for lunch, dinner & Sunday brunch menus!" Can't wait! Center of photo: owners Jim Sheridan, Mike Silla (holding scissors) and Jeff Lyons. 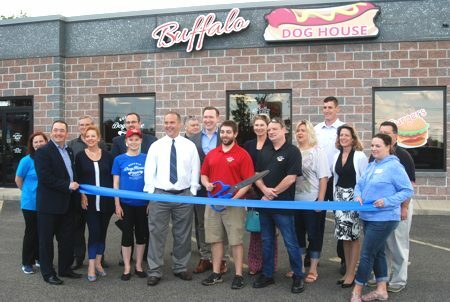 A Chamber of Commerce sponsored ribbon cutting took place at the Buffalo Dog House, 1752 Grand Island Blvd., on Tuesday, June 20th. Many members of the Chamber along with owners Jim Sheridan, Mike Silla and Jeff Lyons gathered for the photo. The restaurant officially opoened on June 5th and serves char-broiled hot dogs and red hots grilled on the flat top. They have burgers, vegan & gluten free items, soft serve ice cream and milk shakes. A kids meal comes with a free cone. A different twist for the usual hot dog establishment is that wine and beer are served. 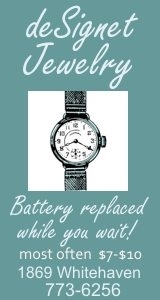 Hours are Monday - Sunday, 11:00 a.m. - 9:00 p.m. The owners are proud to re-open a closed establishment. They previously did that with a closed chain restaurant on Niagara Falls Blvd. Buffalo Roadhouse Grill has been very popular for years, and proclaim the "best ribs in Buffalo". It's the place with the free peanuts in the shell! From left: Kurt Raepple & Gene Mongan at Grand Island store. 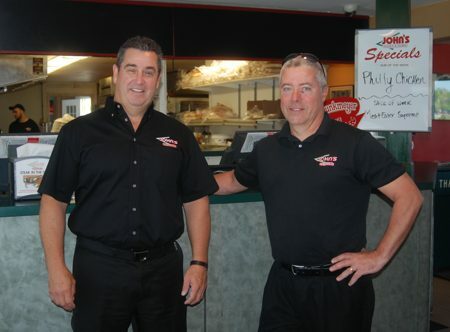 Gene Mongan and Kurt Raepple are celebrating the 35th anniversary of John's Pizza & Subs this month. The friends from elementary school, started the business June 2nd, 1982 with Kurt's brothers, Mark & Jay, at a store on Niagara Falls Blvd. in Tonawanda. Over the years they have added three more stores, located on Grand Island Blvd., Delaware Avenue and Campbell Blvd. Mark and Jay have retired within the past five years. The next generation has almost 20 years in the business. Nephew Jason Raepple runs the Delaware Ave. store and Islander Alex Rumsey is manager of the Grand Island John's. Always looking for ways to keep their customers happy, Gene and Kurt look for new ideas to keep the stores fresh and customer service tip-top. They care about their employees, and try to give them opportunities to advance. The best selling item and Gene's favorite is their Chicken Finger sub, invented by the company in 1982. Kurt's favorite is the Steak and Cheese sub. After all these years, their recipe for success has not changed. Use high quality ingredients in all your menu items, don't skimp on quality to save money. Congratulations on 35 great years! New entrance sign at Fantasy Island. GRAND ISLAND, NY, May 4, 2017 - Fantasy Island is excited to announce that their 2017 season will begin Saturday, May 13. This season will be the first full season under the ownership of Apex Parks Group, which acquired the park last season from longtime owners Martin DiPietro and his family. Fantasy Island will open a new arcade next to the popular "I Got It" game, and will also offer new games in the Galaxy of Games building. Guests will have several new food items to choose from. Beef on Weck and personal pizza will make their debut this summer, as well as some local craft beer selections. And the restaurants will now be air conditioned to help our Guests beat the heat. One of the additions to the park that Guests will notice are cabanas in the water park. These will be available to be rented on a daily basis through the park's new website, www.FantasyIslandNY.com. Each cabana comes with chairs, a table, locker access and bottled water to keep you cool. Synor added, "We encourage everyone to check out our new website. They'll be able to see the new offerings, as well as purchase Season Passes & daily tickets. In fact, the prices online will offer a significant savings over the Ticket Booth price." 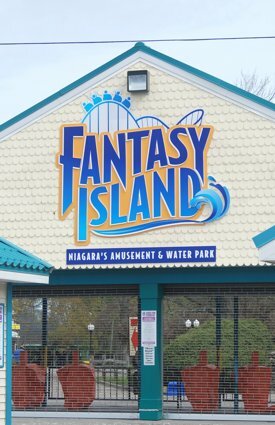 Fantasy Island is a family-oriented, classic American theme park situated just minutes from Buffalo & Niagara Falls. With so many rides, shows & attractions, it's "Fun. Done. Right." at Fantasy Island. Enjoy their "thrill" rides, the wide variety of family rides, and the exciting Water Park - all for one low admission price. Fantasy Island Season Passes are on sale for $44.99 each when you buy 2 or more. This limited-time, special low-price is only available online at FantasyIslandNY.com. Isledegrande is happy to announce that Steve Kopf of Edward Jones Investments has signed on as an advertising sponsor. Steve is an Island native and would be happy to help you with all your financial needs. Check out his web ad and website. Fahim and Seema Mojawalla of Island Ship Center, 1879 Whitehaven Rd., have yet another service to offer. They have just completed printing beautiful wedding invitiations for an Island family, and printing the envelopes. Sally Kaiser wrote: "We are so pleased with the amazing wedding invitations Fahim and Seema printed and facilitated for us. They went above and beyond helping with many aspects of the creation process. Island Ship Center saved us money but even more important is the care and commitment they provided. Excellent in every aspect of the work they provided!" See story. Island Ship Center will be closed Friday afternoon, April 14th until Monday morning, April 17th. Aceti's Wine and Spirits, 2156 Grand Island Blvd., is hosting a free wine tasting and book-signing on Saturday, April 22nd, from 2:00 p.m. - 6:00 p.m. Western New York native and author John Aceti, is Sam Aceti's uncle. His book, "Wineries of the Texas Hill Country Plus One Fine Brewery", is a photographic journey to the wineries on the renowned Rte. 290, through the city of Fredericksburg, TX. The author will give a brief presentation, followed by a Q & A session, and signing books available for purchase. John Aceti was born in Niagara Falls, New York. He received his Bachelor of Science degree from the State University of New York at Fredonia and his Master's degree from the University at Buffalo. He retired to the Texas Hill Country in 1993 following a thirty-four year career as a teacher, school administrator and as an educational consultant. 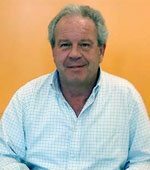 John has served as an adjunct professor at several universities in New York State. He has written a number of articles for state and national administrative educational journals. He also is the author of four other books. The wine tasting will include the newest spring and summer wines available. For more information contact Sam Aceti- Aceti's Wine and Spirits. Phone: 716-773-9463 or visit www.acetiswineandspirits.com/. From left; Fahim Mojawalla, Shannon Zaccaria, Paul Hinderliter, Mike Antonelli, Vanessa Hinderliter, Carley Antonelli and Eric Fiebelkorn. 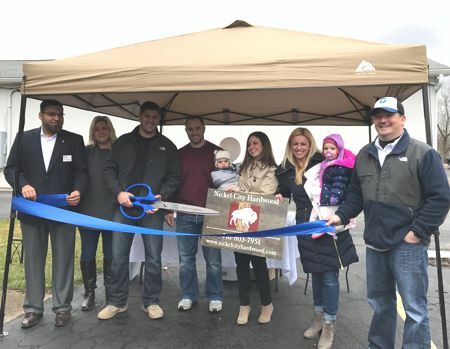 Islanders Carley and Mike Antonelli and business partners Paul and Vanessa Hinderliter opened Nickel City Hardwood, 1870 Whitehaven Road. An Open House and Ribbon Cutting was held on Saturday, April 1st. 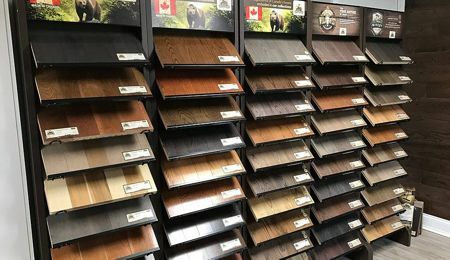 The Nickel City Hardwood showroom is open by appointment only, keeping overhead low and passing on the savings to customers. They carry hardwood, engineered hardwood, luxury vinyl planks, luxury vinyl tiles, and Timbercore. They also offer an extensive collection of ceramic, glass, and porcelain tile, perfect for your floor, backsplash, or shower. Call 803-7951 to set up your appointment with their friendly staff, today. Jennifer C. Earsing, R.N., M.S., A.N.P.-B.C. 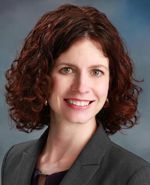 Jennifer C. Earsing, R.N., M.S., A.N.P.-B.C., will see patients at Memorial's Grand Island Family Practice and its Lewiston Primary Care Center. An adult nurse practitioner with seven years of experience in her field, Earsing earned a master's degree with specialization in Adult Health Nursing from the University at Buffalo. She received her Bachelor of Science in Nursing from Daemen College. Earsing previously worked for Amherst physician Dr. Allyn Norman and for the Buffalo Heart Group, where she provided both inpatient and outpatient care. She is a member of the American Association of Nurse Practitioners and Sigma Theta Tau, the National Honor Society of Nursing. To schedule an appointment with Earsing at the Grand Island office, call 773-6181. The number at Lewiston Primary Care is 298-4050.